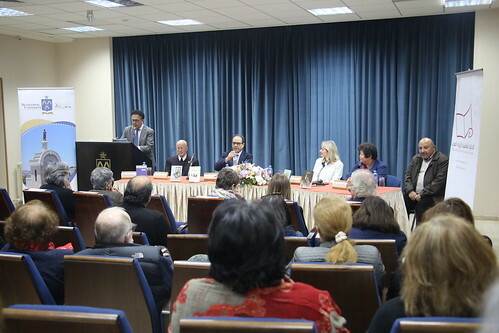 Bethlehem University hosted the 12th International Prize for Arabic Fiction (IPAF) shortlist discussion on Thursday, 7 February 2019. The second panel discussion on this year’s shortlist was held in Furno Hall with IPAF judge Zhang HongYi, Chair of Trustees Professor Yasir Suleiman, and Prize Administrator Fleur Montanaro. In his welcoming remarks, Vice Chancellor Brother Peter Bray emphasized the role of literature in providing insights about the lives of Palestinians referring to the novel “Mornings in Jenin” by Susan Abulhawa that was gifted to him a few years ago. The Dean of Research Dr. Jamil Khader welcomed the panel on campus and moderated the discussion. He introduced the prize and listed the shortlisted titles. Professor Suleiman gave a brief historic view of IPAF and explained its goals. Ms. Montanaro talked about the way the novels were nominated while Ms. HongYi gave insights on the selection process. Six shortlisted authors have been announced earlier on Tuesday, 5 February 2019, during a press conference held at the Palestinian National Theatre El-Hakawati in Jerusalem. The first shortlist discussion was held at Khalil Sakakini Cultural Center in Ramallah on Wednesday, 6 February 2019. The IPAF Board of Trustees chose Palestine to hold a series of events in recognition of the flourishing Palestinian literary scene. The IPAF is an annual literary prize for prose fiction in Arabic, which rewards excellence and encourages the readership of high quality Arabic literature internationally. It is sponsored by the Department of Culture and Tourism – Abu Dhabi (DCT Abu Dhabi) and is run with the support, as its mentor, of the Booker Prize Foundation in London.